I haven’t been able to write for several days because of flu symptoms. But I thought I should “drop in”. The events in Paris have left me numb. I looked at the photograph of persons who died at the Bataclan. Some were very young. President François Hollande called the massacre an act of war. It is my understanding that Canada’s Prime Minister, Justin Trudeau, is pulling Canada out of the Middle East. I wonder whether or not he will reconsider this decision in light of Friday’s brutal and senseless attacks. This time, President Hollande was blamed. Terrorists always find a scapegoat. The attacks will no doubt complicate the migration crisis. Europeans may fear some refugees are terrorists in disguise. In Canada, tout le bataclan is translated as “the whole kit and caboodle”. But the word “bataclan” has acquired a new meaning. I feel so sorry for the victims, their families, their friends. France has lost one of the Four Freedoms, freedom from fear. I grieve for France. French Canadians look upon the French as cousins. Laws do change from country to country. In the 16th century, Montaigne (28 February 1533 – 13 September 1592) had come to the same conclusion as Pascal, but Montesquieu (18 January 1689 – 10 February 1755) is the political philosopher who best demonstrated that laws depend on a very large number of factors, one of which is climate. Montesquieu is the author of Les Lettres persanes (1721), The Persian Letters, and the Spirit of the Laws (1748). The notion of relativity is central to both Montesquieu’s Lettres persanes, an epistolary novel, and the Spirit of the Laws. In the Persian Letters, Paris and France are seen from the perspective of Usbek and Rica, two noblemen from Persia. The book constitutes a comparative description of two different societies. 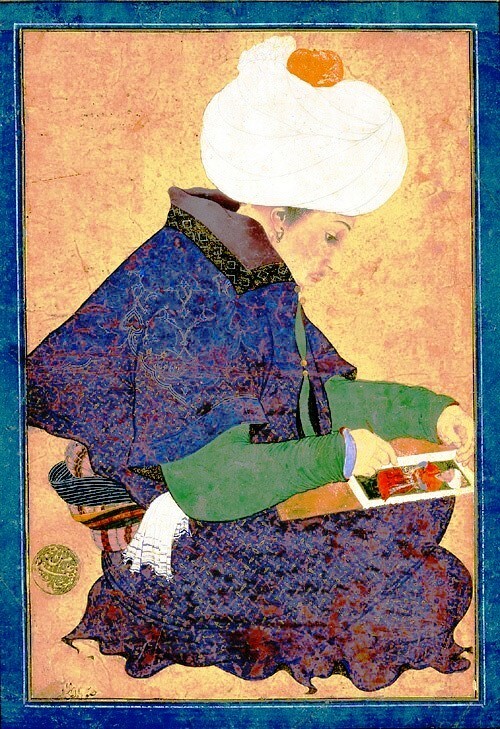 The Persian Letters were written when “turquerie” was fashionable, from the late Renaissance, until the early part of the 19th century. It is an oblique text, a form of saying without saying. One cannot punish a foreigner for expressing views about the country he is visiting or his country, if he is elsewhere. Applied to three different types of governments, laws have a different impact, hence their relativity. 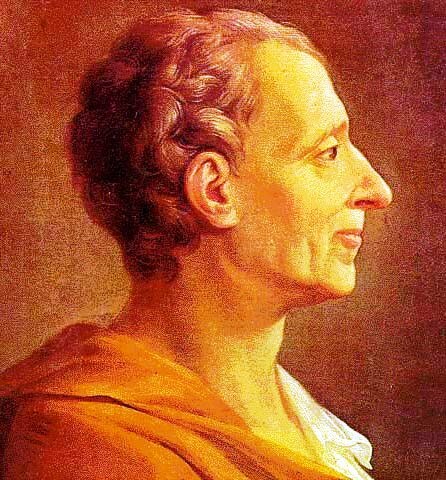 Montesquieu critiqued laws and governments by applying laws to three types of government. I should also note that, contrary to Thomas Hobbes, Montesquieu believed human beings were born good, but were later spoiled by society, which vilifies society. The Spirit of the Laws is descriptive. Montesquieu claimed he was happy living in a monarchy. However, he did advocate constitutional governments. French monarchs were absolute monarchs. He also advocated the separation of powers: the legislative, the executive, and the judicial. 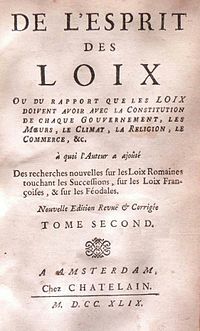 De l’Esprit des loix served as a model to American founding fathers. A man is innocent until a jury finds him guilty. Moreover, although Montesquieu’s Spirit of the Laws is descriptive, he had opinions. For instance, Montesquieu condemned slavery and we owe him the notion that a man is innocent until a jury finds him guilty. Therefore, there is advocacy in De l’Esprit des loix. The relativity of laws is problematical and, therefore, an issue I would like to raise in this post, though not at great length. At the moment, we have local laws as well as an international law, and an international criminal court, at The Hague, Netherlands. Moreover, we have the United Nations‘ Universal Declaration of Human Rights /la Déclaration universelle des droits de l’homme (UDHR) and other international agencies. Yet, although we have endowed ourselves with international covenants, it remains possible to torture people and detain individuals rather gratuitously. In fact, the 18th century culminated in the United States Declaration of Independence drafted by Thomas Jefferson (13 April 1743 – 4 July 1826), who owned slaves, and the French Déclaration des droits de l’homme et du citoyen, drafted by the Marquis de Lafayette (6 September 1757 – 20 May 1834), assisted by Thomas Jefferson, and passed by the National Constituent Assembly in August 1789. Yet, nearly three centuries later, the United Nations’ Universal Declaration of Human Rights /la Déclaration universelle des droits de l’homme (UDHR), adopted on 10 December 1948, seems as utopian as the United States Declaration of Independence. 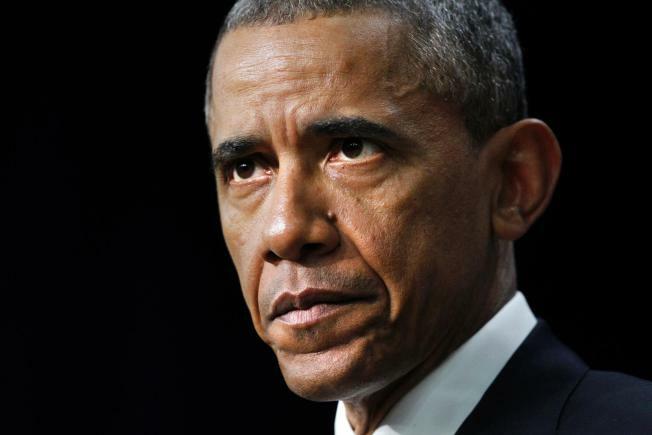 President Obama is trying to save the middle class, but resistance is enormous. Equality is difficult to achieve. As for other abuses of human rights, they constitute a common occurrence. I would like to suggest that, despite the very real possibility of infringements, it would be in humankind’s best interest to implement, within limits, its international covenants and, in particular, its human rights as defined in the United Nations’ Universal Declaration of Human Rights. Given such violations as the sentence inflicted on Raif Badawi, it would be my opinion that the abolition of torture should be given serious and prompt attention at an international level. It should override local laws. There are areas where there cannot be a double standard. Torture is one such area. Moreover, ISIL must be crushed. It is “natural,” rather than “cultural,” for a caring wife to do all she can to spare her husband punishment he does not deserve and which constitutes torture, a blatant infringement of the United Nations’ Universal Declaration of Human Rights. It is also “natural,” rather than “cultural,” for Muath-al-Kasasbeh‘s father to grieve the burning alive of a beloved son and to call for revenge. The entire world is condemning this crime against “humanity.” I have noticed that the media have started describing Mr Badawi as the “father of three.” An innocent “father of three” is a greater victim than an innocent blogger. 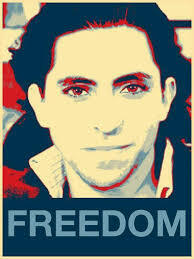 Raif Badawi should not be tortured and arbitrarily incarcerated. In fact, this is a “natural” rather than “cultural” law. As King Abdullah II of Jordan stated, the Muslim faith does not condone such cruelty as the burning alive of Muath al-Kasasbeh. Gone are the days, or gone should be the days, we burned at the stake 19-year-old Joan of Arc. Humankind has long yearned for the best possible government. We have already discussed the theories of such political philosophers as Thomas Hobbes, John Locke and Jean-Jacques Rousseau, all of whom came to the conclusion that the rule of law, just laws, had to prevail. President Obama is saying that “the fight against violent extremism demands a new approach.” I believe this is what I have been attempting to state in this post. It would be my opinion, that a good education would help prevent radicalization. A good education does seem the best tool we have to bring about lasting changes. What have we been teaching our children? They are still joining ISIL as though it were an option. It isn’t. Could it be that we have not been teaching our children to think? If they do not think they may fall prey to indoctrination and terrorize the world. In short, to what extent should respecting the Universal Declaration of Human Rights /la Déclaration universelle des droits de l’homme (UDHR) be based on consent and membership? And to what extent should local laws allow serious violations of human rights. Laws vary from country to country, but no local law should allow a serious infringement of international law. I experienced difficulties writing this post. Proposing that individual nations comply with international law is a sensitive matter. Absolute monarchs do as they please and terrorists are not amenable to reason. But when humanity is besieged, one looks for a remedy, a remedy which may consist in respecting human rights which is international law. See Essays, Book 1, last two chapters. Since Plato’s Republic, if not earlier.